New Belgium Brewing’s “Hop Kitchen” is a hoppy playground for the brewers to play around. The seventh edition of the series is a veritable United Nations of hops additions you’ll come to know as Hop the Pond. So named, because the beer features hops and malts from many nations. Hop the Pond IPA is a trip around the world in 80 IBUs. Experience Admiral hops from England, Galaxy from Australia and Citra from the US of A. The malt bill hails from Chile, Germany, England and Canada. Set sail with one sip. 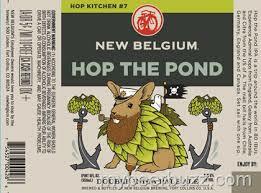 New Belgium Hop the Pond will be available in 22oz bombers, and draft. Coming this Fall from Founders Brewing Co.